I'm very excited to have Valerie Sjodin as our Lent Words guest writer and artist today! I have long been an admirer and looked to Valerie early on for inspiration as I sought to combine my art journaling and my faith. I got to know Valerie through her blog and online classes. 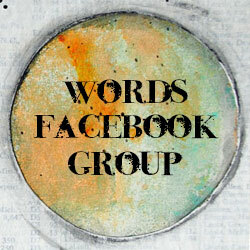 This year our friendship grows as we team up with Bernice Hopper in our Facebook group Everyday Journals ~ Living Your Word of the Year. 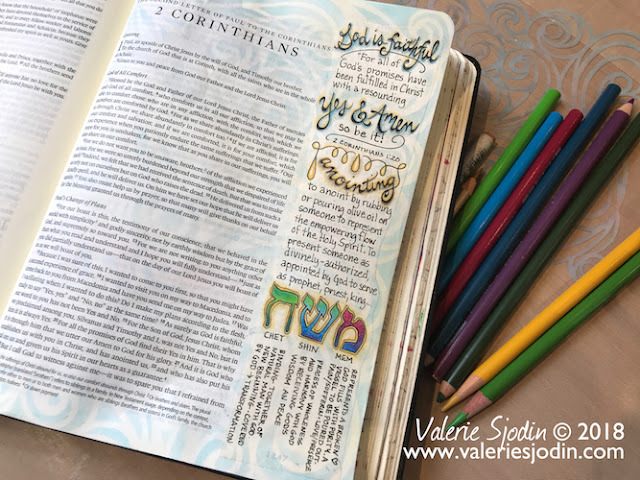 I encourage you to visit Valerie's blog, Visual Blessings, and check out her classes, plus her new book release, Prayerful Doodling. When Mary asked me about to write a guest post for Lent Words 2018, I chose “Anointed” because it is one of those words that was not used much in my conservative evangelical upbringing, and I wanted to understand its meaning more. Another reason the word intrigues me is I want to learn the connection with anointing and the presence and power of the Holy Spirit. In the Greek, the Strong’s definition (5548) is xríō – to anoint by rubbing or pouring olive oil on someone to represent the flow (empowering) of the Holy Spirit. 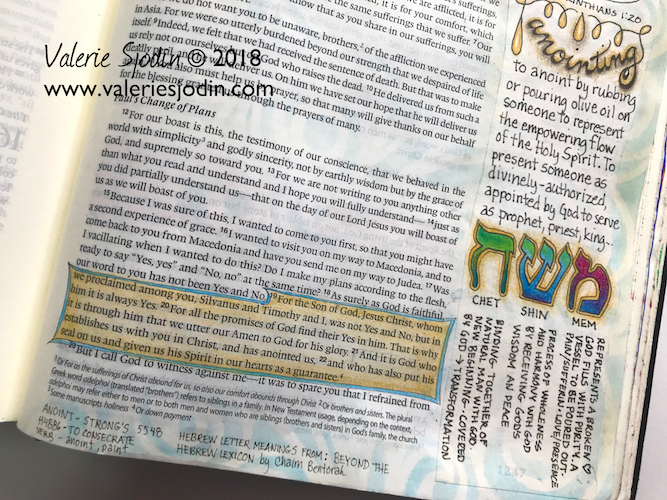 Anointing (literally) involved rubbing olive oil on the head, etc., especially to present someone as divinely-authorized (appointed by God) to serve as prophet, priest or king, etc. When I read passages like the one in Acts 10, I used to think, “Well, Jesus is God so that’s why He had the Holy Spirit and could always do good and heal the sick and cast out demons.” I could never do anything like that, but that’s not really what the Scripture says. It says God anointed Jesus, presented him, divinely-authorized, appointed to serve as our High Priest and King. Jesus, Yeshua, is completely God, but also completely man. Paul challenges us to literally become like Christ in every way since (2 Corinthians 1:20) all of God’s promises to us are fulfilled, complete in Christ. According to Paul, it is possible to become like Christ, to grow up, becoming more like Christ all the time by being filled up with the Holy Spirit. The Spirit of Creator God is the one who gives us actual physical life, making humans in his image. God longs to give us a renewed, abundant spiritual life through our relationship with Jesus Christ, the presence and power of the Holy Spirit within us. All this makes me yearn for more, a deeper love relationship with God, Jesus, Holy Spirit, and to experience more of the presence and power of Christ living in me. Amen! YES Lord! Let it be so.